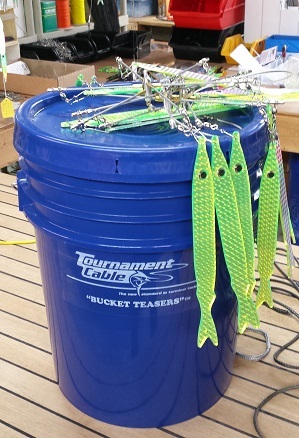 The Tournament Cable Bucket Teaser is perfect for any size boat. Easy to deploy, easy to stow, easy to troll… it’s easy to see how effective this teaser is. Great for smaller boats or for a crew still getting used to dredge fishing, this durable stainless 6-Arm triple tier dredge is custom designed to fit right inside a bucket for easy storage. But don’t let its size fool you — though it may be more compact it still presents just as effective as a bait ball, and is a wonderfully efficient teaser.